Notification No. 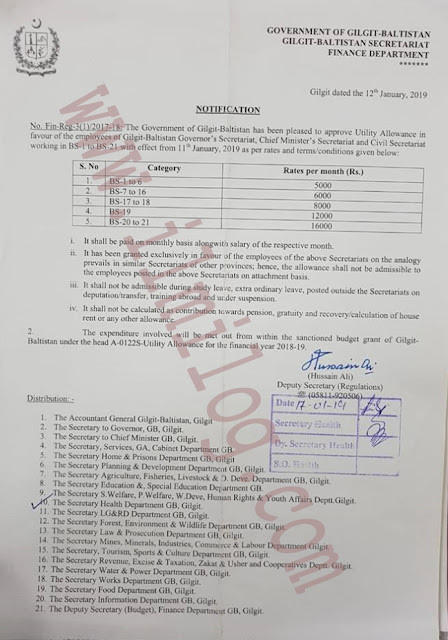 fin-reg-3(1)/2017-18 Gilgit dated the 12th January 2019 regarding utility services in favor of Gilgit Baltistan employees of Governors Secretariat by Gilgit-Baltistan Government finance department. 1. It shall be paid on monthly basis along salary of the respective month. 2. It has been granted exclusively in favor of the employees of the above Secretariats on the analogy prevails in the similar secretariats of other provinces, hence the allowance shall not be admissible to the employees posted in the above secretariats on attachment basis. 3. It shall not be admissible during study leave, extraordinary leave, posted outside the Secretariats on deputation/transfer, training abroad and under suspension. 4. It shall not be calculated as a contribution towards pension, gratuity and recovery/calculation of house rent or any other allowance. The expenditure involved will be met out from within the sanctioned budget grant of Gilgit-Baltistan under the head A-01225-Utility Allowance for the financial year 2018-19. I. The Accountant General Gilgit-Baltistan, Gilgit 2: The Secretary to Chief Minister GD, Gilgit. 3. The Secretary, Services, GA, Cabinet 4. The Secretary of Agriculture, Fisheries, Livestock 5. Human Rights & Youth Affairs Health Department GB, 6. The Secretary department GB, Gilgit. 7. The chief Law & Prosecution Department GB. 8. The Secretary Min, Minerals. Department 9. 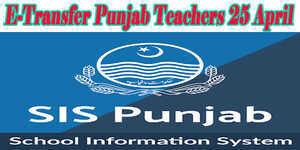 The Secretary Water & Power Department GB. 10. The Secretary Information Department GB, Gilgit, 11. The Deputy Secretary (Budget), Finance Department GB, Gilgit.